Then she moved to Singapore and we continued to keep in touch. She was a raving fan of TLD even back then, and always showed great support. She then started the Athena Network in Singapore, and we were called in to do the website for that – which we completed in 2 weeks! 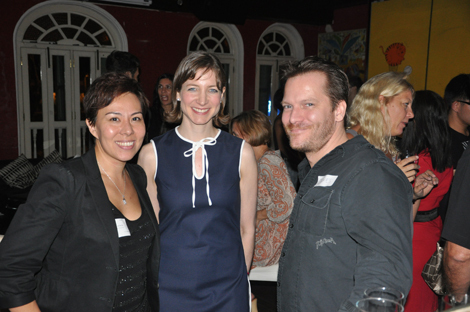 I was able to go to Singapore in April and spend more time with Gina, and I gave a talk at one of her “Business Rocks” events and at an Athena Singapore meeting. Read the post about it here on the Athena Singapore website and also my post about my week in Singapore here. 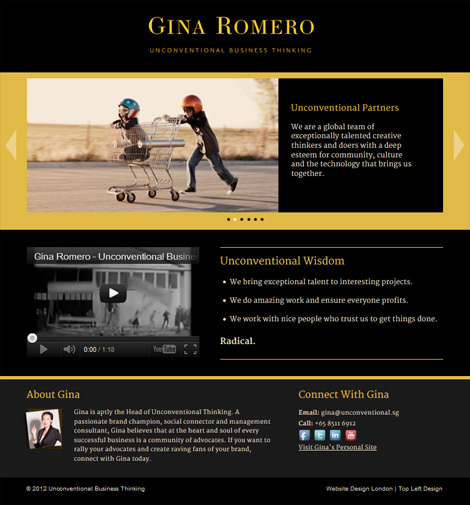 Since then we also did a website for her own consultancy business – Unconventional Business Thinking. 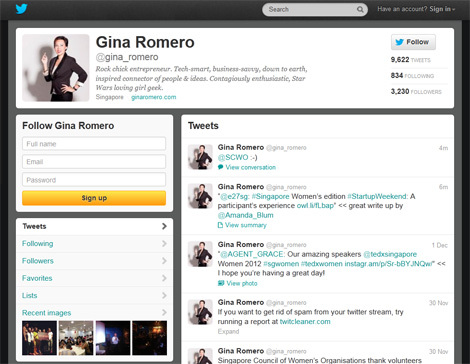 A really great example of a single pager which gives all the right information, has amazing copywriting and links to Gina’s social media profiles. 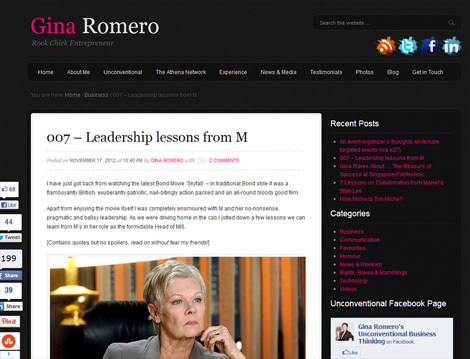 Gina regularly blogs as well – and I love the way she draws analogies to things people already know about – like the 007 blog post she wrote recently – “Leadership lessons from M” – all in line with her girl geek persona! 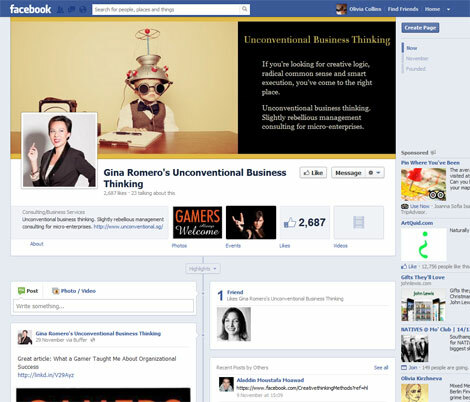 Gina maintains her business and personal Facebook pages as well – regularly sharing inspirational quotes and images as well as blog posts and updates, all about entrepreneurialism and lots about women in business in Singapore. And on the day I sent her my questions for my interview, she responded within the hour. Ask a busy person! Your first business was an IT company right? What 3 things did you learn from that which you apply to your current working life? I was actually a technophobe when I started my IT business! I got involved to support my husband build a business around his passion for technology. I learned a lot about bad branding – our business started out of our back garage selling refurbished laptops on eBay. We were called ‘Bargain Laptops’. Eventually we evolved into a boutique technical solutions company based in Mayfair servicing small private investment banks. In terms of technology, I went from technophobe to girl geek. Not because I love technology in itself, but I love the power of connecting people. Technology is the greatest enabler of connectivity and communication. What made you decide to start Athena Singapore? I wasn’t planning to start anything! I was just looking for an existing community but I couldn’t find anything quite like Athena where we teach women to network effectively and strategically. It makes networking much more efficient and worthwhile than ‘open’ networking. I decided to import the Athena concept from the UK, a community of like-minded business focused women who want to make the best use of their networking time. What has surprised you most in business? I realised a little while ago that it’s a lot harder trying to be who you assume other people would deem as more ‘credible’. It’s really hard work to try to fit into all the boxes we put ourselves in, I got tired of living a ‘Barbie lifestyle’ – once I decided to let my personality shine through my business persona, people were more drawn to working with me. Well, not all people, the right people. What lessons have you learned that you wish someone told you at the beginning? Bring in someone to deal with the bits you aren’t good at. I nearly lost my 1st business due to my lack of skills in negotiation and finance. I was afraid to bring anyone in because I didn’t think I could afford it. Now I realise that if you have a great idea, people will buy into it in the longer term and help you get it up and running. Once it’s up and running, make sure you reward all the people who ‘paid it forward’. Building a great network is key to bringing in the right resources and support especially when you are starting up. 3) Choose work that pays well. I make sure everything I work on ticks at least 2 boxes, if it doesn’t I don’t take it on. What are your 3 big plans for 2013? I’m really looking forward to Social Media Week Singapore in February, which my event Business Rocks is taking part in. We also have a huge entrepreneur event in August which I am very excited to be involved in, my focus is enabling more women led startups in the region with a focus on socially responsible business practices. I’m also looking forward to opening up lots of new partnerships with The Athena Network Singapore and the big technology brands – I’m on a mission to make technology more accessible to female entrepreneurs. 2012 has been a big year for you – tell us about your 3 biggest achievements in 2012? The biggest achievement this year was our partnership with Google to run the pilot for Women Entrepreneurs on the Web in Singapore. 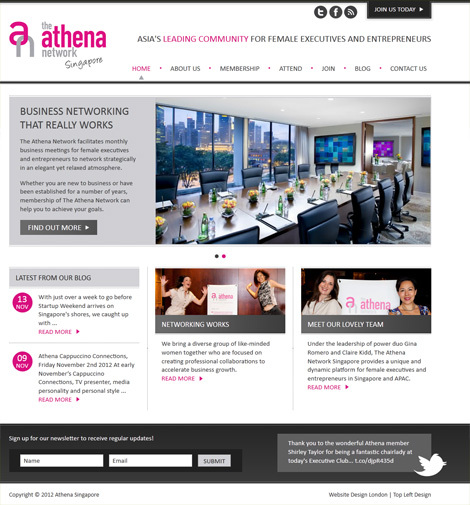 The Athena Network Singapore was the community partner for the 5 month programme. The pilot was a success and Google Singapore are rolling it out to 400 female led businesses next year! Following closely was partnering with Maila Reeves from The Next Woman (UK), and Lachimi Tiwari (a Singaporean born entrepreneur) to run the very first Startup Weekend Women’s Edition in APAC which had over 60% female participation. This was a great achievement for us as the 3 day event typically gets a 20% female attendance globally. We also pulled the event together in just over 6 weeks!